This is a sweet little turn of the century oil on canvas of 3 freshly hatched chicks. 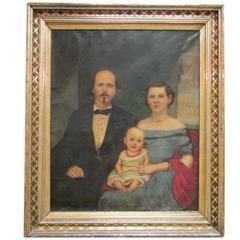 This is a late 19th century family portrait oil on canvas in it's original gilt wood frame. Artist unknown. 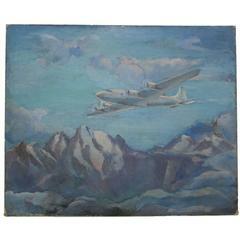 This is an oil on canvas of a DC-4 airliner depicted flying over "The Hump" in the Himalayan Mountains during the second world war, circa 1940, artist unknown. This is a psychedelic oil on canvas signed and dated "Voorhees 70." Oil on canvas of the 19th century, signed Bouvier, 1890 Painting: H 26cm, L 21cm Frame: H 43cm, L 37cm, P 6cm. Beach scene with a young female figure in foreground. 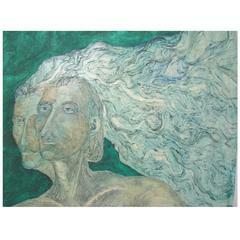 Oil on canvas, highly decorative carved frame. Signed in the right bottom corner "L.v.d. Pol". An oil on canvas, landscape of a river scene with people washing and horses being led across a ford, circa 1840.